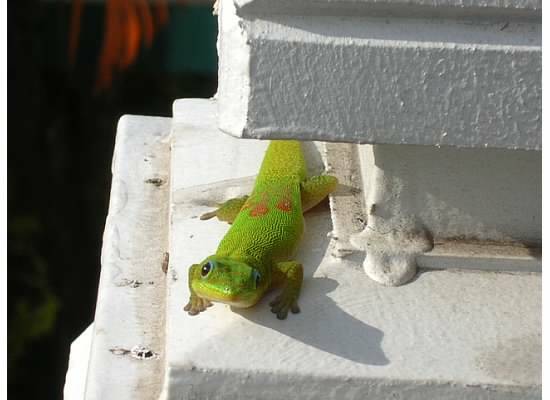 Hawaii has its share of geckos and they are surprisingly active during the daylight hours. They scurry and hide if they see you, but this little guy (or is it gal?) posed for the camera and looked so friendly, as if to say, “Well, hello there.” I always wonder, however, if the local residents find these lizards annoying, sort of like we find salamanders in our region. Now, I am not a reptile expert, but I believe that this is an orange-spotted day gecko. They like to eat papayas, bananas or anything sweet with nectar or sap. 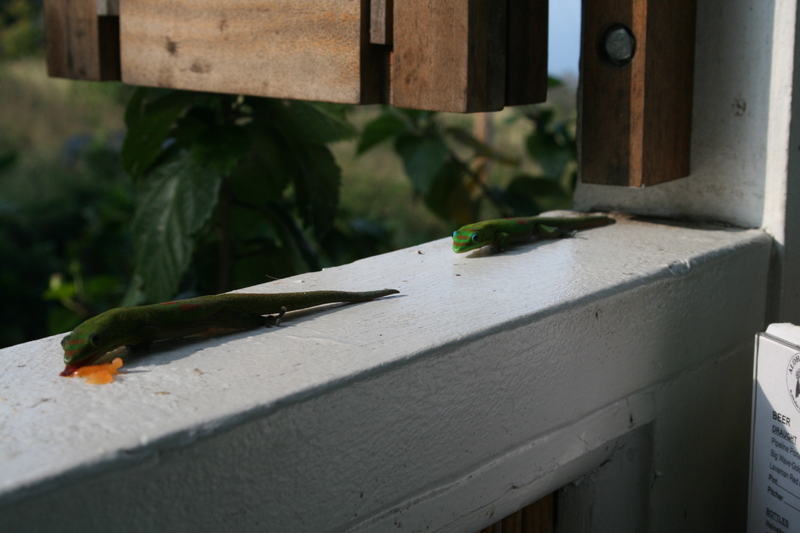 We saw these geckos fighting over something sweet on the edge of a lanai at a breakfast joint on the Big Island. The bright green, along with the orange spots, almost gives them an animated look and feel. Or, maybe it’s those GEICO ads? Either way, this mainlander thinks that they are pretty darn cute. This entry was posted in Hawaii, Travel and tagged Animals of Hawaii, Big Island, geckos, Hawaii, Hawaiian Islands, United States by alohajournal. Bookmark the permalink.